RIT will be a host site for the 2016 International NASA Space Apps Challenge, April 23–24. This weekend, NASA will have its “eyes” on Rochester Institute of Technology as a host site for a unique two-day hackathon, powered by AT&T. RIT is one of 200 host sites from around the world for the 2016 International NASA Space Apps Challenge taking place from 9 a.m. Saturday, April 23, through 8 p.m. Sunday, April 24. 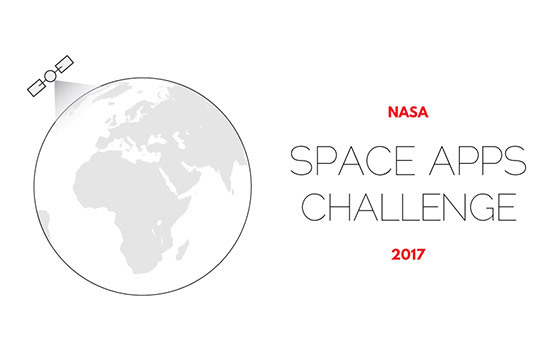 The global challenge is designed to engage thousands of problem-solvers in working with NASA to create solutions to international and interdisciplinary problems using open-source data. The event—free and open to the public—will take place at RIT’s Center for Media, Arts, Games, Interaction and Creativity in Student Innovation Hall. Coders, makers, designers, students, engineers and artists will be among the global participants in the event, which is one of the world’s largest international annual hackathons. This year, 25 challenges are spread across six different themes: Earth, Space Station, Solar System, Technology, Aeronautics, and Journey to Mars. Within these themes, the challenges range from easy to advanced. For example, hackers can choose to develop a game that simulates conditions in an “off-Earth” permanent or temporary colony, or develop an app for children that uses smartphone and tablet sensory to locate the moon at any time of day or night, unlock lunar phase data and read a moon-related story. "RIT is proud to, once again, host the Rochester location for the 2016 NASA Space Apps Challenge,” said Dan Schneiderman, FOSS@MAGIC Research Associate and Community Liaison. “We’re lucky to have such incredible partners both on and off campus to bring this challenge back to RIT. With all of the students and faculty working on projects to help out the local and global communities, we’re truly a campus that aims for the stars." The schedule of events also includes presentations, “Hackers in the Dust,” by Pat Rapp from Desert Wizard of Mars, builders of Black Rock Observatory and the Mars Rover Arts Car; and “Simulating and Discovering Gravity Waves,” by Hans Peter-Bischof and James Healy from RIT’s Center for Computational Relativity and Gravitation. This talk will be live streamed (open captioned) via the Ustream video-streaming platform. It is available via browser at http://www.ustream.tv/channel/rit-events. An Ustream app is available for both Android and iOS mobile devices; after downloading, search “RIT Events” to find the stream. Awards will be presented at 7 p.m. April 24. Two projects will advance to the international round. For more information about the event, go to https://2016.spaceappschallenge.org/locations/rochester-ny-usa.